Speaking at a NATO summit, the alliance’s chief on Thursday said that Georgia will join its ranks. At a joint press conference in Brussels alongside Georgian President Giorgi Margverlashvili, Jens Stoltenberg said that the allied leaders reaffirmed the move on Wednesday. Praising the progress Georgia is making on reforms, Stoltenberg said that NATO will continue to work with its government to prepare the country for membership. Earlier, during a joint press conference with Ukrainian President Petro Poroshenko, Stoltenberg said that the situation in eastern Ukraine remains "serious". "NATO is firm in our support for Ukraine’s sovereignty and territorial integrity. And we strongly condemn Russia’s illegal annexation of Crimea," he added. Russia’s 2014 illegal annexation of Ukraine’s Crimea region led Western powers, including the U.S., to impose sanctions on Moscow. Along with the UN General Assembly, the U.S., the EU, and Turkey also do not recognize Crimea as Russian territory. Since the annexation, Ukraine has been wracked by conflict in its eastern regions with Russian-backed separatists, leading to more than 10,000 deaths, according to the UN. U.S. President Donald Trump launched a fresh attack on NATO allies' failure to raise defence spending on Thursday, prompting leaders to huddle in a special session excluding other summit participants, sources told Reuters.At one point, in a break with diplomatic protocol, a source said Trump addressed German Chancellor Merkel by her first name and told her: "Angela, you need to do something about this. "As Trump amps up trade war, China plays nice with foreign investorsInvited leaders from non-NATO countries Afghanistan and Georgia were asked to leave along with most NATO leaders' retinues of officials, as the heads of state and government of the Western alliance sought to deal with the man whose nation commands much of the budget and forces for Europe's defence.Trump had opened the first day of talks in Brussels on Wednesday with a public diatribe against Germany, the second biggest state in the Western defence alliance, before the mood appeared to have calmed as the summit went into its second day, focusing on operations beyond Europe.But, several sources said, Trump instead reopened in strong terms his demand that other countries greatly speed up their progress toward a NATO target of spending at least two percent of their GDP on defence, which now has a deadline of 2024 with get-out terms available that can stretch it to 2030.After Trump's spending demands, NATO summit turns to Afghanistan"The language was much tougher today," one source told Reuters. "His harshest words were directed at Germany, including by calling her Angela --'You, Angela. '"As well as Merkel, Spanish Prime Minister Pedro Sanchez and Charles Michel, the prime minister of Belgium, were also singled out by Trump for undershooting on their spending targets when U.S. taxpayers, funding a defence budget worth about 3.6 percent of their national income, foot much of NATO's bills.Breaking from a carefully scripted session that was to focus on Ukraine and Georgia, one source said Trump "forcibly restated his position on wanting NATO members to reach 2 percent spending target to a short a deadline".Trump keeps up spending demands at NATO but turns on charmTwo NATO sources said, however, that Trump had not issued a threat to pull the United States out of the alliance that it helped found to keep the peace in Europe after World War Two.TWITTER DEMANDLeaders had gone into the second day, set to focus mainly on ending the long war in Afghanistan, with low expectations, showing the extent of European frustration with Trump's "America first" policies among the other 28 members of the alliance.Trump took to Twitter to say publicly what he told NATO leaders privately on Wednesday, calling on all allies to meet a commitment agreed in 2014 to spend 2 percent of economic output on defence to counter threats ranging from Russia's military modernisation to militant attacks on European cities.He also renewed a demand that they even double that -- though many question what they could usefully spend it on.US experts raise concern over FETÖ threat in America"All NATO Nations must meet their 2% commitment, and that must ultimately go to 4%!" Trump tweeted an hour before the second day of the summit got under way.Despite the first day's haranguing of allies for failing to meet spending targets and accusing Germany of being a prisoner to Russian energy, Trump was mild-mannered at a private dinner on Wednesday and avoided any outbursts that many NATO diplomats had feared. "He was in a good mood, he said Europe was a continent he appreciated," Luxembourg's Prime Minister Xavier Bettel told reporters. "We didn't know what to expect, it was a positive outcome," he said of the dinner in a Brussels park, where leaders were treated to an acrobatic display and saxophone music.French President Emmanuel Macron said the summit atmosphere was "much calmer than everyone had said" and he saw a will to maintain the unity of the alliance, while Croatian President Kolinda Grabar-Kitarovic said Trump was "constructive". 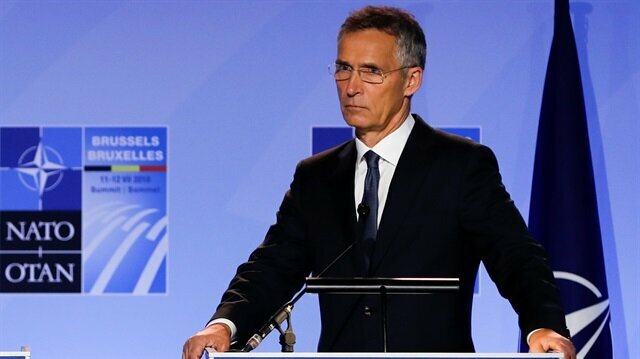 A two-day NATO summit started on Wednesday with the attendance of 29 NATO heads of state and government to make important decisions on the future of the alliance. The summit is discussing important decisions on the alliance’s future and other major topics, including strengthening deterrence and defense, counter-terrorism and stability, strengthening cooperation with the EU, modernization, sharing responsibility and common values, and the transatlantic union.